Tomas Berdych hit out at umpire Marijana Veljovic claiming she was unable to control the crowd during his four-set victory over Kazakhstan’s Aleksandr Nedovyesov. 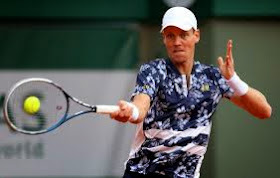 Berdych dropped the first set before striking back 6-7, 6-4, 7-5, 6-3 in a difficult second round encounter against the world No101 and was seen complaining to the umpire about the noise coming from the crowds. The Czech is no stranger to rowdy spectators having represented his country in numerous Davis Cup away ties but he says the umpire didn’t do enough to handle the situation. “I was more irritated by the referee, because once you tell her or once she said something (to the crowd) about being quiet, I can barely hear that and I'm on the court just a few metres from her,” said Berdych. “She was really probably not well-experienced for that. She definitely couldn't handle the situation. “Really she was trying to step in at the wrong time when already the guy was serving or... Really not experienced enough to handle it like that. “Of course I played many Davis Cup matches, but even when we played in Argentina where it was crazy loud, once you were ready to play there is complete silence. Berdych was on his way to complete a routine comeback after dropping the opening set but then fell behind 0-3 in the fourth. He won six games in a row though to book a third round with Spaniard Roberto Bautista Agut, who gave a solid and composed performance to beat Frenchman Benoit Paire 6-4, 7-6 (4), 6-2. Paire saved five match points on his own serve in the seventh game to hold for 2-5 but it only delayed the inevitable as Bautista Agut served out the match comfortably. The Spanish No27 seed – tipped by many as a dark horse for this tournament - is seeded for the first time in a major, and following his win over Juan Martin del Potro at this year’s Australian Open, his good results this season and elevated ranking, is Bautista Agut feeling extra pressure this fortnight? “I try to focus on me, not to think too much and play match by match and that’s what I’m trying,” said Bautista Agut. He leads Berdych 2-1 head-to-head and beat him most recently in Indian Wells this year.